Ah, so that’s how he does it. While in Canada, Abort Magazine caught up with Tech N9ne for an exclusive cover story on what it’s like to reign as the independent king. 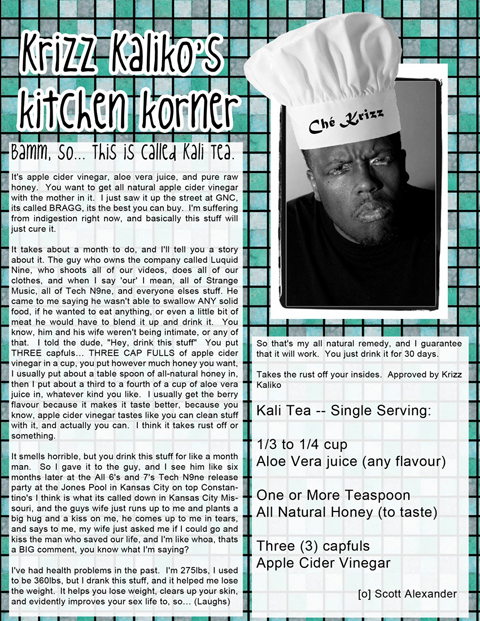 Of course, it was only right that Krizz Kaliko got his own bit shine in the pages of the new issue and in this exclusive sit-down, Krizz Kaliko reveals the ingredients to his cure-it-all Kali Tea. Krizz Kaliko explains that this seemingly miraculous mix of ingredients has helped him stay healthy and with a schedule like his, who could argue? Check out the latest issue of Abort Magazine and find out what fuels the genius Krizz Kaliko! Click here to download issue 18 of Abort Magazine. What do you make of Kali Tea?